Each attendee, registered for an event, goes through several states: registered, paid, participated, left an evaluation. You can easily change these states to make Workshop Butler performs required actions. For example, reminders to provide an evaluation are sent only to the attendees who participated in the event. Keeping the states of attendees up to date gives you a clear picture of what you need to do (send an invoice, ask for evaluation). Check the Attendees tile below. It notifies you that two attendees haven’t paid and four didn’t attend the event. To get more information about the attendees, click View link at the top right corner of the tile. The Attendees screen helps you to find attendees of your interest. For example, you want to check who hasn’t paid yet and get their emails. Use Payment status filter to find the unpaid attendees. You can also change the payment and participation statuses of selected attendees, and learn more about each attendee. Click a button with an arrow on the right to open the attendee’s page. 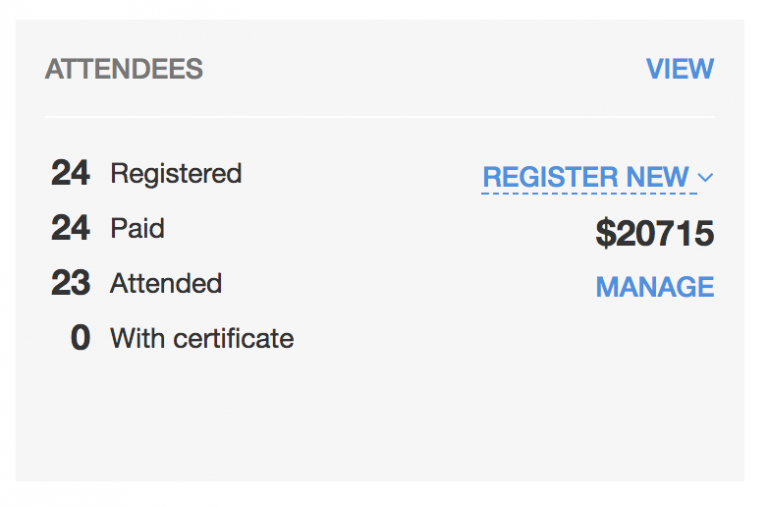 In case you used another system to accept the registrations, you can easily add attendees manually. Read How to register an attendee manually for more information.